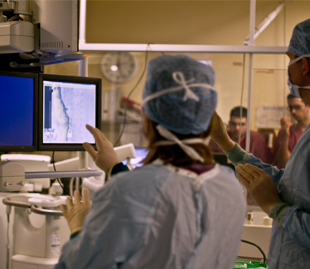 Microsoft Kinect launches a surgical revolution! It must be every surgeon’s dream to just wave his arms wide in the air and be able to have a closer look at the infected part of the patient’s body. Till a few days back, it was just a part of the movies. Not anymore, thanks to Microsoft and the power of Kinect for Windows. Labeled as the ‘Touchless Interaction in Medical Imaging’, this project undertaken by a team from Microsoft Research Cambridge, consisting of social scientists, computer scientists and designers, now enables the use of simple hand gestures to change, move, or zoom in on CT scans, MRIs, and other medical images without the need to touch a physical mouse or keyboard which adds the risk of being unsterile. This is a major development in the medical field as it may allow doctors to perform surgeries faster and with increased accuracy. Presently being tested, the Kinect for Windows sensor here is able to track multiple people within its vicinity and obey commands accordingly, something which other camera-based gestural systems are incapable of. It can also be trained to focus on a particular surgeon and his commands by responding to the words “Kinect, control” and looking out for a raised hand. This would enable the sensor to only watch and listen to this particular subject and ignore all others who may be talking and gesturing at the same time. The operating room consists of a Windows PC connected to a fluoroscopy scanner through an external video-capturing device, a Kinect for Windows sensor attached to the PC with a USB cable, and an LCD monitor. During surgery, the fluoroscopy scanner captures real-time X-ray images, which are overlaid on one another, registered, and displayed in an image viewer. A surgeon then uses gestures to rotate images, zoom into details and more. A surgeon can easily stand by the patient’s bed and operate the system using his hand gestures and voice commands, without the need to move back and forth around the system or even touch a physical object. This amazing development can spring up endless possibilities in this field and this gives more reasons to fall in love with Microsoft Kinect, a revolution of sorts. And if you though Kinect was just a gaming device, you were wrong!